PPH presents Ghost Dog: The Way of the Samurai | Here’s the poster! Now just a shade over two weeks away, our screening of Jim Jarmusch’s cult classic Ghost Dog: The Way of the Samurai at the Clapham Picturehouse is starting to cause some serious flutters of excitement. Join us on Thursday 21 March for the big event. You can – and absolutely should – book tickets by following this link. Our last few events (including a 35mm summer screening of Do The Right Thing, and ATCQ doc Beats Rhymes and Life) have been very busy indeed, so book now to avoid disappointment! To further whet your appetite, we’re delighted to unveil the event poster, designed by the ridiculously talented Piccia Neri. This entry was posted in Events and tagged Clapham Picturehouse, event, film, Forest Whitaker, Ghost Dog: The Way of the Samurai, Jim Jarmusch, Piccia Neri, Thursday 21 March on March 4, 2013 by Ashley Clark. 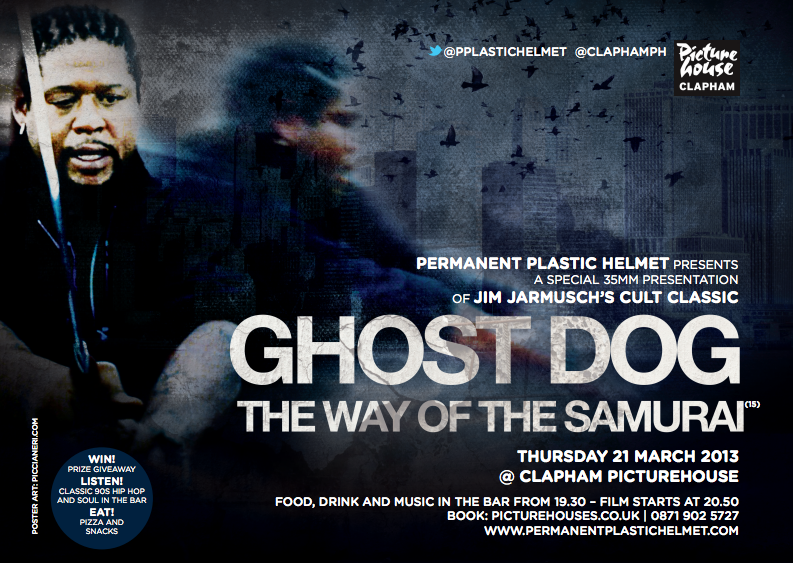 For the fourth instalment of our ongoing Permanent Plastic Helmet presents… series of events, we are delighted to announce a 35mm screening of Jim Jarmusch’s extraordinary, unclassifiable classic Ghost Dog: The Way of the Samurai. The time and place? 20:50 on Thursday 21 March 2013 at south London’s lovely Clapham Picturehouse. Come to the bar before the screening for drinks and free food, all soundtracked by classic 90s hip-hop and soul. Before the film commences, there will be a free prize draw and an introduction by PPH editor and film critic (Sight & Sound, Little White Lies) Ashley Clark. This entry was posted in Events and tagged 35mm, Clapham Picturehouse, event, Forest Whitaker, Ghost Dog: The Way of the Samurai, Jim Jarmusch, PPH presents on February 1, 2013 by Ashley Clark.